Need advice about a specific BMW X1 problem? Chart based on 45 repairs. See TSBs and recalls for the 2013 BMW X1. Chart based on 35 repair trips. The repair cost chart excludes repairs made under warranty, do-it-yourself repairs, and repair trips that include maintenance. 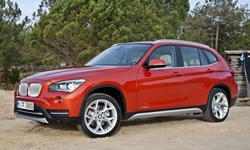 See repairs for all BMW X1 model years. 15700 mi Periodic restarting of navigation system. New nav system replaced. US $10 Low coolant warning, added coolant. Coolant leak? Low engine oil, added 1qt oil. US $1900 Replaced cracked windshield, hit by a rock. Very expensive replacement by BMW. BMW windshield required for lease return. 13640 mi It appears that the head gasket has failed. There is evidence of coolant washing 4 cylinders. There is also evidence of water in the oil (from oil analysis). 15000 mi low coolant. Pressure tested, no leak found Check engine light came on. US $460 Thermostat heater failed. Took two trips to repair, initial replacement part was bad. US $578 Replaced Breytone wheel and painted to match other wheels. 39700 mi Service engine light. Dealer replaced thermostat. Covered by warranty. 10000 mi Failure of passenger seat restraint system warning light keeps going off. problem fixed by moving passenger seat back all the way. Don't know what is causing this. It seems to be temperature related. It only happens when outside temperature is above 70 degrees. The repair was unsuccessful. 28000 mi Shuddering on acceleration, mainly at low speeds and only with some throttle openings Driver's seat belt would sometimes not extend. 33000 mi Transfer case replaced under warranty; this caused the shuddering on acceleration reported in May, 2016. US $250 Car computer said brake fluid needed replacing. 8000 mi One of the steering headlights failed, giving an error message. The headlight was replaced. It took two days to get the part. I have to say I was very impressed, I got use of an X1 loaner and they also updated the NAV software. 21000 mi Both sideview mirrors were not heating to defog. Both mirror glass pieces replaced. Jan 2014 When changing the oil, the technician cross threaded the drain plug. A repair was attempted using a threaded insert. Now the oil pan will be replaced. Part is on order, from Germany, they are expecting 10-12 days for delivery. 24500 mi Thermostat replaced. The car produced a "service engine soon" light. Side view mirrors replaced again due to not heating to defog. 57800 mi engine is smoking and is not stopping smoking at start up and warm up. white smoke. Repair is not defined at this time, vehicle is still in the BMW garage. C $75 Front Right top plate noisy. 56420 mi Car stalls out when selected into drive when cold. Seems ok after restart. Will repeat occasionally when started cold. No repair attempted yet. Squeaky rear suspension started on right side now seems to be coming from both sides. Suspect corrosion on bushing. Will troubleshoot as soon as weather warms up. See our lemon odds and nada odds page to see vehicles with no repairs or vehicles with more than three repairs. To see how frequently 2013 BMW X1 problems occur, check out our car reliability stats.